Paper thin moon at night, tumbling low. Light floods the quiet house. And in the daylight hours, hot yellow daisies, blue skies and the white butterfly. It is April, and all is well in small swatches of life, here and there, across the universe. On skype, my brother waves his son's pink feet at us, until his sleepy son gives him (and us) a pained, weary look. I suppose it is rather trying being ogled and exclaimed over, across the universe. Father and son yawn in unison. Cry, feed, sleep, be adored, cry, feed, sleep. Be celebrated, on your birthday. The Other Brother is striding across the Kalahari desert on his birthday. Some sightseeing, more Human Rights work, and an Angel by his side. 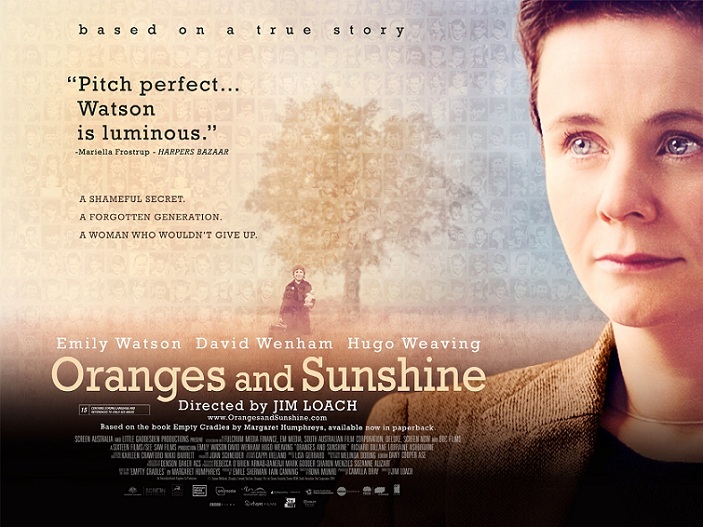 A few days ago, I watched 'Oranges and Sunshine' at the Arts Picturehouse. Based on the book 'Empty Cradles', it is the extraordinary work of Margaret Humphreys, a social worker from Nottingham, who stumbled upon a government organised scheme, deporting English children to Australia, Canada, New Zealand - 150,000 children, from the 17th century until 1976 when the scheme was abolished. Home Children was part of the Whitening of The Empire. And cheaper for the government. It cost £5 a day to care for a child on British welfare, but only ten shillings overseas. Poor single mothers were assiduously relieved of their little boys and girls, who in turn were told their mothers had died, and promised oranges and sunshine in exchange for their compliance in boarding ships and crossing arid scrubland. The governments have now apologised. It took 350 years for that apology, too late for tangible re-unions. Somewhere in the universe, my brother tucks up my nephew in my knitted blanket. How easily that possessive little pronoun trips off my tongue. My. Three generations of women knitted into that blanket for the fourth to snuggle under. How lucky am I to know my mother, my grandmother, my great grandmother, my great-great... inspite of the pain, mine is a lucky, lucky life. The world is so much smaller than it used to be. Good to hear all is sunny in yours. I'm adding the movie to my queue. I adore Emily Watson. The British Government did what? Until 1976? That's dreadful. Skype is the most wonderful of invention. What an amazing story. I will look for that movie for certain, Shaista. Am glad they are bringing these things to light. Have you seen Tha RabbitProof Fence about the rounding up of aboriginal girls and putting them in residential schools in Australia? True story about how two sisters escaped and traveled vast distances to return home - not once, but twice. I love the glimpse you gave us of your baby nephew and yes, you are very lucky to have known your great and great greats.........how wonderful! I always love reading your words, you are such a sunny girl! "Cry, feed, sleep, be adored, cry, feed, sleep. Be celebrated, on your birthday." We are all so very lucky... me more so for finding your words. Good, political withoug being strident work. I have been known to feel sorry that I did not know my grandparents. I do still. But I had my parents, and they loved me. The treasure of family is perhaps the greatest one. To be forced and lied to in such a process is too sickening to contemplate, but it is good when someone can do so, and bring these things to light. There's still so much to be done, to undo what our race has done. Will it ever end? Precious nephew. So much love. "Three generations of women knitted into that blanket for the fourth to snuggle under." And what a lucky nephew of yours he is! TGFS! (thank goodness for Skype!) And eggs. And human rights awareness. And knitting. And butterflies. And you. Beautiful, bonded, poetic, generations of family love...I enjoyed this immensely. Beautifully written and so informative. Another good change of scene by following the ornge, not the egg!